It is an egg laying type Hydraulic Press Type Single Phase Concrete Block Making Machine on wheels, which will lay block on the concrete floor and move to the next laying. Any type of concrete block can be produced with consistent quality by fixing different types of concrete mould and ram in the machine. We are a well-known manufacturer and exporter of the large assortment of Hollow Block Machines,Solid Block Machines,Single Phase Hollow Block Machines,Single Phase Solid Block Machines,Block Machines,Little Block Machine,Concrete Block Machines,Three Phase Hollow Block Machines,Kerb Stone Machine,Paver Block Machine,Tiles machine,Material Handling Trolley, Earth Rammer Machine, Vibro Forming Table and much more In Coimbatore. 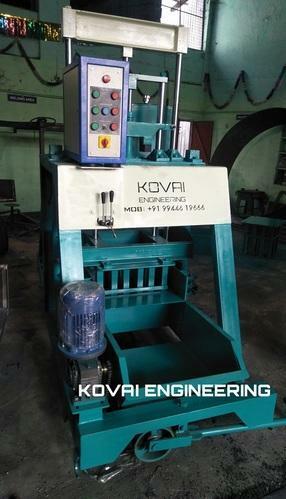 Known for manufacturing and exporting a wide range of best quality Concrete Pan and Color Mixer Machines, Kovai Engineering has started its operation in the year 2016. Offered products range consists of Vibro Forming Table, Concrete Pan Mixer Machine, and Colour Mixer Machine. These are designed on the basis of ultramodern technologies prevailing in the industry and using the high-grade raw material. Our products are appreciated for their features like damage resistance, easy to use, fine finishing, long life, and lightweight. Additionally, we are offering these products at very reasonable rates. We have made a highly sophisticated infrastructure base. This infrastructure includes manufacturing, sales, and research& control departments. We use latest machines and processes in our production, quality assurance, and packaging. Apart from this, our R & D unit works hard for exploring latest technologies and removing deficiencies of the products manufactured by us. Owing to our ethical business policies, transparent dealings, and client-centric approach, we have a long list of our satisfied clients.